Janome 6600P - What's in the box? 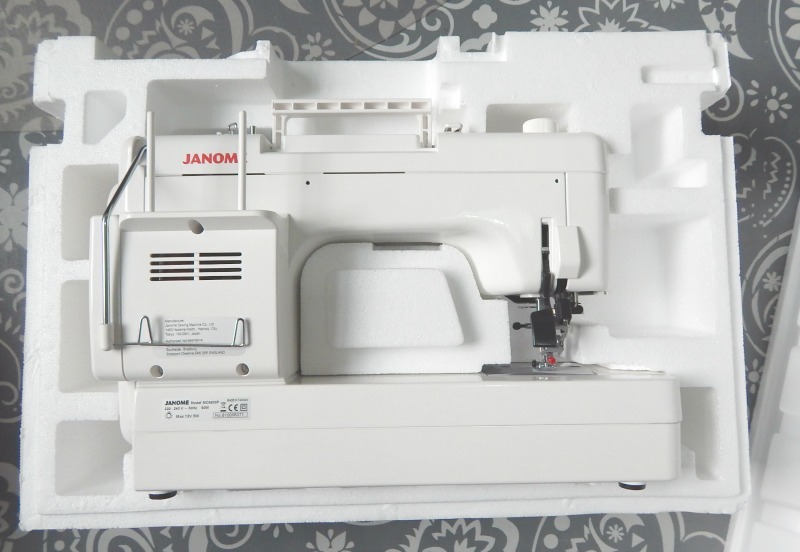 I'm possibly the luckiest girl alive, I just got a new sewing machine, the Janome 6600P! Amanda and I did a ton of research on what would be the best machine for a bag maker, and we came up with either the 1600p QC or the 6600p, both from Janome that were best suited to me. 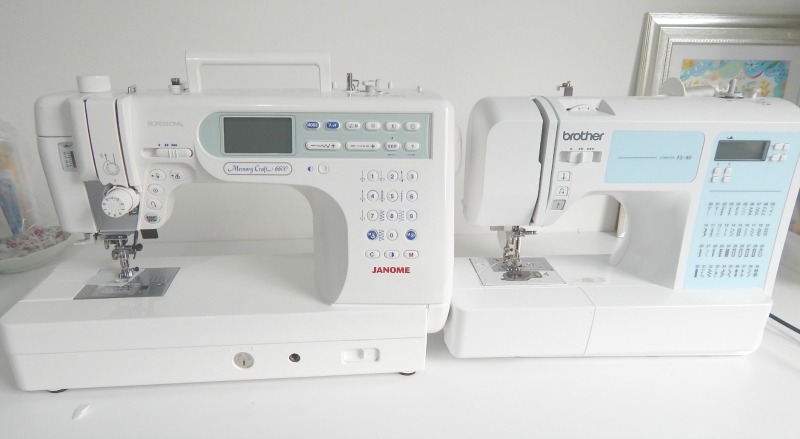 I chose the 6600p simply for the other stitch functions that are available, as the 1600p QC is a straight stitch only machine. 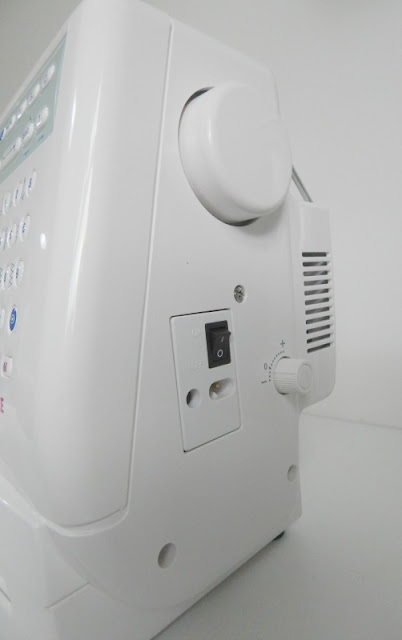 I received my new Janome 6600p last week, and took photos as I unboxed it, and my first impressions to share with you. I'll share a full review with you all when I've used it for a few weeks, but for now, it's safe to say that I am head over heels in love with it! I took these photos as I unpacked the machine, so try to imagine my excitement! First up, this is what I was confronted with when I opened the box, lots of goodies above the machine! That's the knee lift lever, the reference board with all the stitches on, the box of feet and accessories on the left, and at the very top you can just see the extension table and cover peeking through the polystyrene. I managed to open the polystyrene backwards so my first view was of the back of the machine. You can see two small round holes on the back near the top, that's where the reference board screws onto with all of the stitches listed. There's 3 different modes, Basic stitches, Patchwork and Quilting stitches and Utility and Decorative stitches, each containing between 66 and 83 stitches for a total of 163 stitches, plus alphabet stitches! In addition to the machine, here are all of the extras that came in my box, still packaged up. 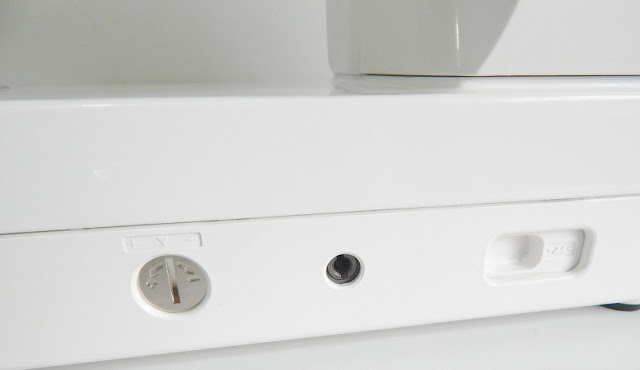 The foot pedal is separate from the power cord which I love. The reference board with the stitches on in blue, the knee lift lever, the dust cover (bottom left), the box containing the feet and accessories at the top, and they're all sitting on the extension table. 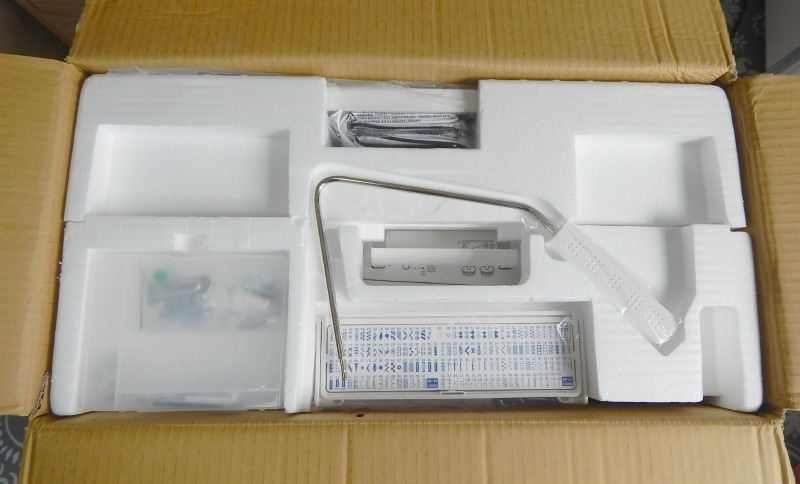 Inside the box, these are the feet and accessories which came as standard. I got two large spool holders, two small spool holders, 4 bobbins, a box of needles, including a twin needle, dust brush, seam ripper, two different screwdrivers, a cloth guide (with green screw bottom right), a quilting bar as well as the standard feet. That's as standard! My last machine came with a regular foot and a zip foot as standard! You know my thoughts on adjustable zipper/piping feet, but I haven't had a chance to get one for this machine yet, so I tried doing a zip pocket with the dual feed foot and by jove it worked incredibly! 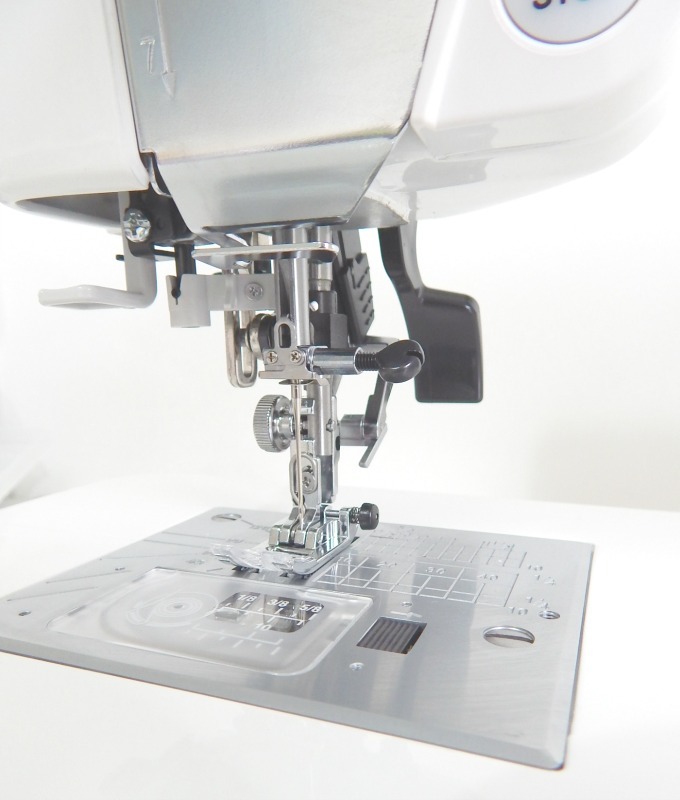 Back to the machine, on the front is a stitch balancing adjusting screw (left), then the hole for the knee lifter (pivoting on pocket corners without needing to remove your hands from the pocket! Amazing!) and then the drop feed lever. Much more accessible than many machines I've seen! Here's the needleplate and bobbin race. 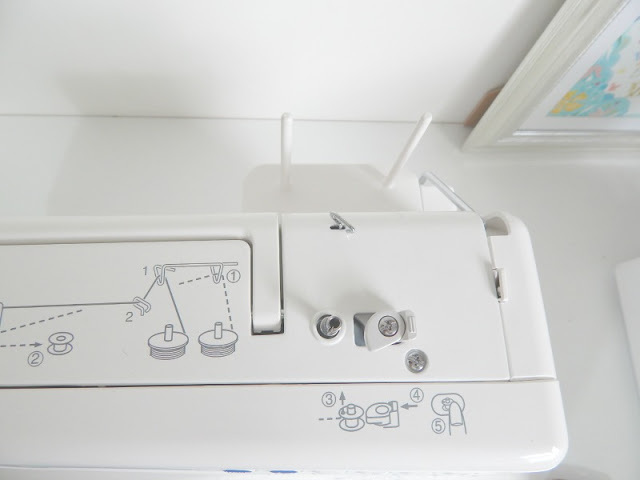 It has a diagram for how to load the bobbin on the top as well as some smaller seam guides. I love that there's diagonals marked on the left of the needle plate. That would be so handy for quilting your stabilisers if you start at the edge! You can see on the left the seam guide is very comprehensive with both metric and imperial measurements. I'm not anticipating any more bits of washi tape to mark where I should be lining my fabric up! 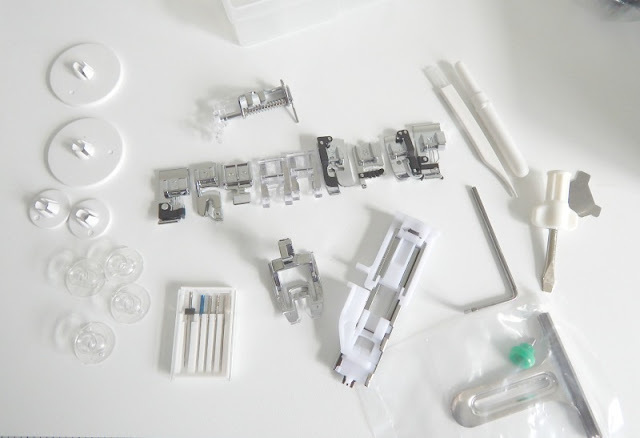 The actual stitch mechanism looks slightly complicated in the pic below, you can see the buttonhole lever, the needle threader, the upper feed mechanism (for the built in dual feed) as well as all the usual doo-dads! I love that this machine has a start/stop button as well as the foot pedal. Sometimes you're not able to sew with your feet (that made sense to me...) so having the option to sew without the foot pedal is great. From the side of the needle/foot set up you can see the large black lever at the back which is the presser foot lifter. I've never had a machine before that you could lift the presser foot to the extra high position and lock it into place. I've used this so many times already. 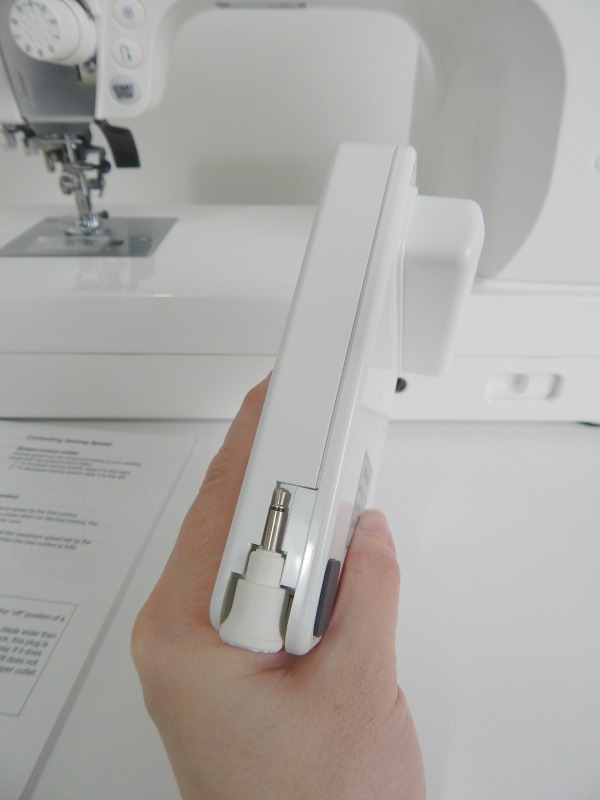 I've used it for placing thick fabrics under the foot without them getting pulled out of place or distorted, and more importantly, I've used it when sewing a zip, I just sew to the zip pull, stop with my needle down, lock the foot into the extra high position, and then I have both hands free to wiggle the zip pull out of the way. It is handier than I even ever thought it would be! On the front of the machine there's the presser foot pressure on the left, the dial on the very top of the machine controls that. You've got the upper thread tension dial, the speed limiter and then the buttons below. I love a speed limiter, it means that you can set it to a slower speed, yet keep up a constant speed when sewing round curves especially. I haven't yet ventured onto the super fast speed, it can go 1000 stitches per minute, which is probably faster than anyone can handle without building up to it. Perhaps more coffee? The buttons pictured above are (from the bottom) the start/stop, to make the machine start sewing without the foot pedal, the reverse stitch button, the lock stitch button, the needle up/down button and the thread cutter button. From above then you can see the foot pressure dial on the left, the threading guides on the middle and right. I love a machine that tells you how to thread it! On the right hand side of the top you can see at the back there's two spool holders. There's also a metal thread guide on the very right which is currently folded down. You can see it in the diagram applied to the top of the machine. On the right near the front is the bobbin winding mechanism. On this machine you bring the bobbin winder stopper to the bobbin, not slot the bobbin into place which confused me momentarily. It doesn't take a lot! Here's the front right of the machine. I love the colour of the face-plate. I didn't choose it for that, but why wouldn't you?! I am not a massive fan of bold, bright colours, I favour pastels in my studio, so this machine fits in perfectly! * Letter style button - Yes, this machine writes too! * Memory/recall button - You can program the machine to remember your favourite pattern combination. Perfect for those of us who baste over turning gaps! 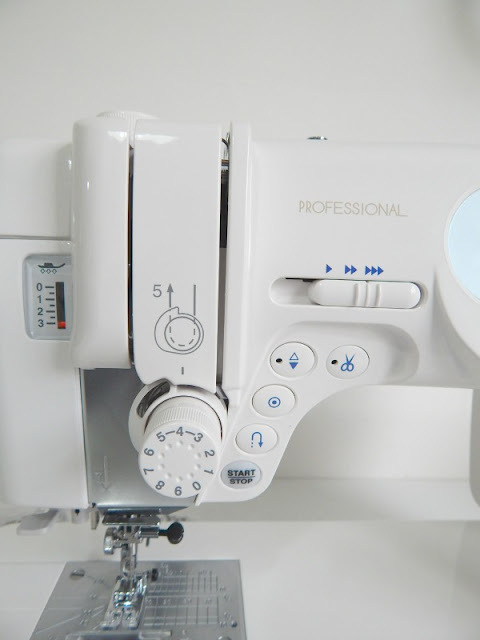 * Twin needle button - If you can't sew two lines of stitching an even distance away (top stitching pockets), then a twin needle is perfect for that! * Stitch length button - this machine goes up in increments of .1mm, you can get really exact! 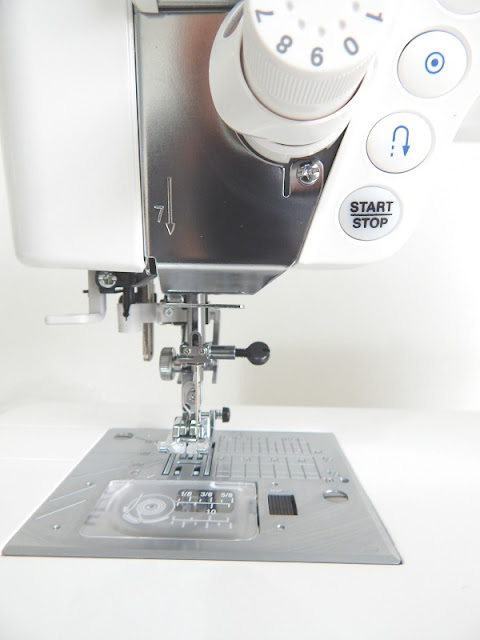 The standard length for straight stitch in Mode 1 is 2.2mm. The round button just below the pretty face-plate with the other buttons is to change the contrast on the display screen. At the right of the machine is the hand crank wheel, the on/off button, the holes for the power cord and foot pedal and the dual feed adjusting dial. The foot pedal is so cool! I've never had a foot pedal with a self retracting cord before. I'm easily pleased! 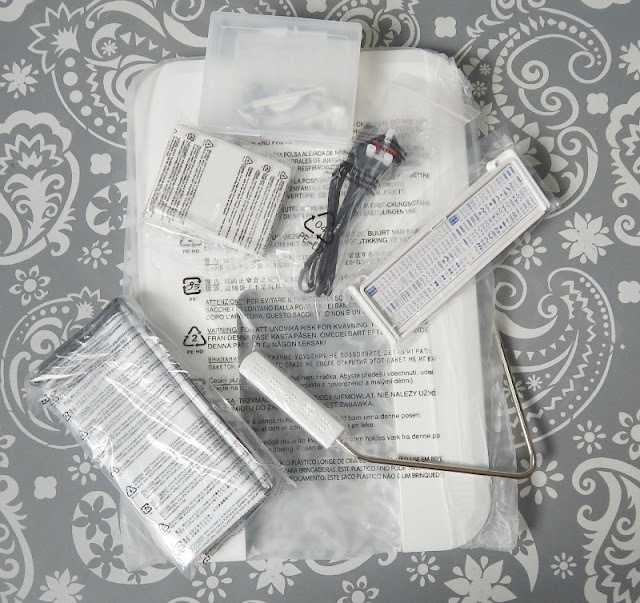 It makes it perfect for packing up and taking to bag retreats (hint), or making sure the lead is the perfect length and won't keep running away from you while you're trying to sew! Here's the display panel with Mode one, stitch one selected. 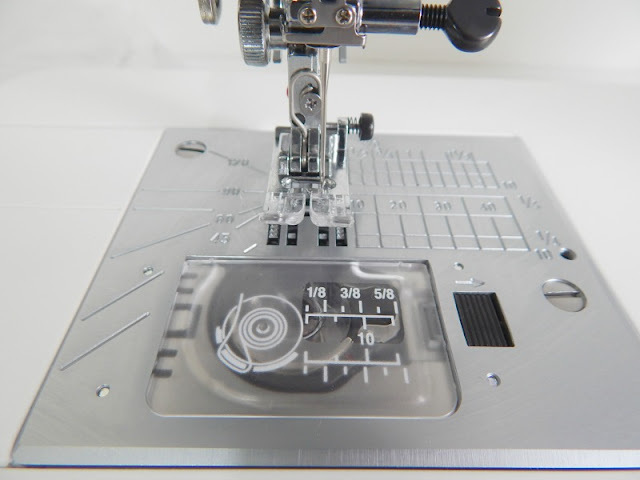 It tells you the ideal pressure for the presser foot, the ideal tension range, which foot you should be using, and the stitch length. Pressing the ? Help button when on this stitch brings up different foot options, including how to fit the dual feed foot. I love the Acu Feed on the 6600p, it's much quieter than using a regular walking foot, and hasn't yet shifted on me once! The buttons on the very right hand side are for selecting the stitch you want. 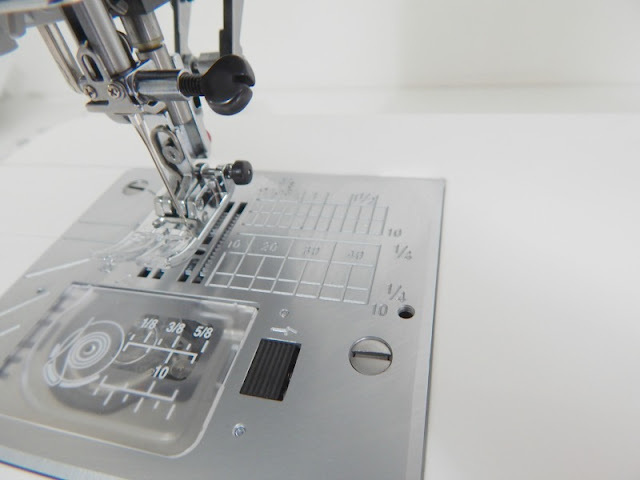 The diagrams are for the first 10 stitch selections in Mode 1, but in different modes you can use them to select the different stitches as on the reference board (shown in unpacking). In addition there's an auto thread cutter button, so your machine will know to cut the threads automatically after the last memorised pattern, and a locking stitch button, so your machine will sew the pattern combination, lock the stitch, then stop automatically. 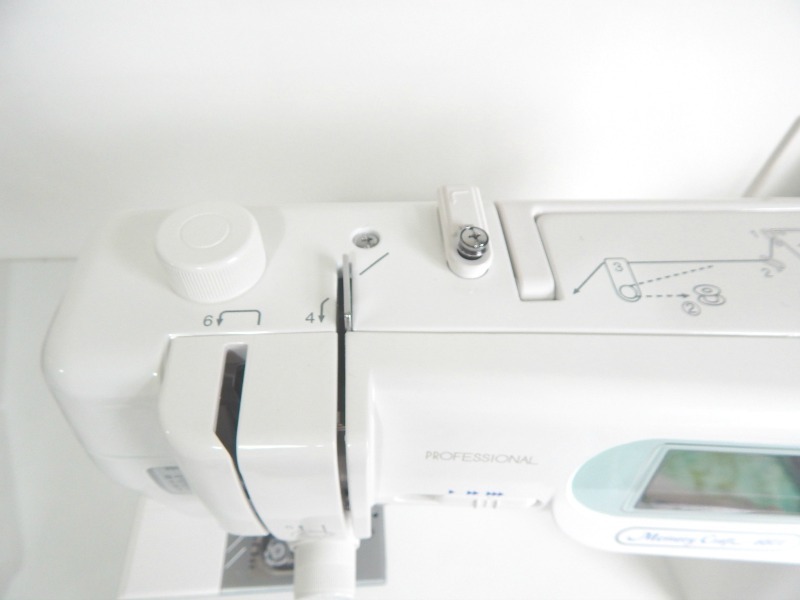 At the bottom there's a Clear button to delete a pattern from the programmed pattern combination, there's a 'turnover' button, so your machine will sew the memorised pattern in reverse... or memorise a pattern in mirror image. And finally there's the memory button. 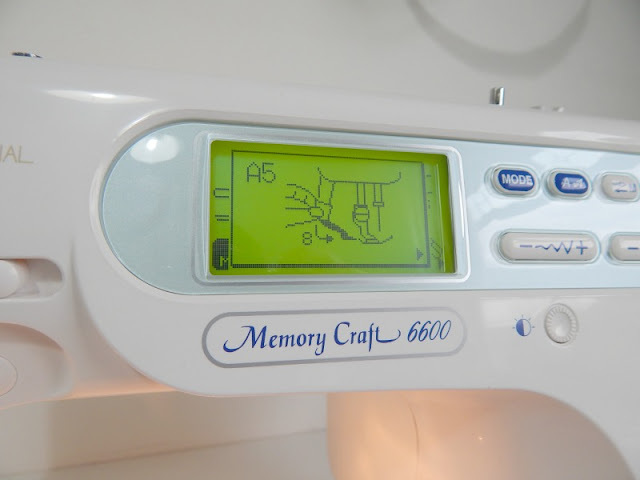 You can press this button to memorise the desired pattern. 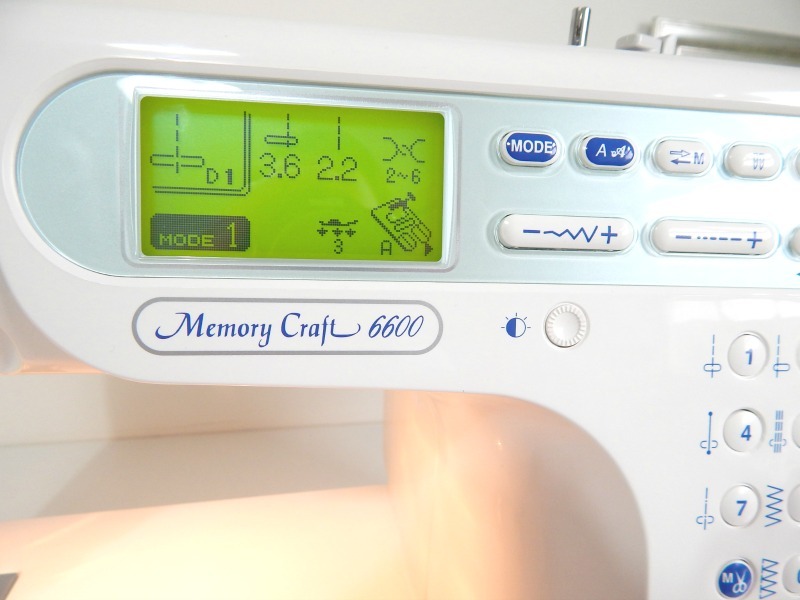 This machine can memorise up to 50 patterns. I really need to have a play with this, I can see that coming in super handy!! 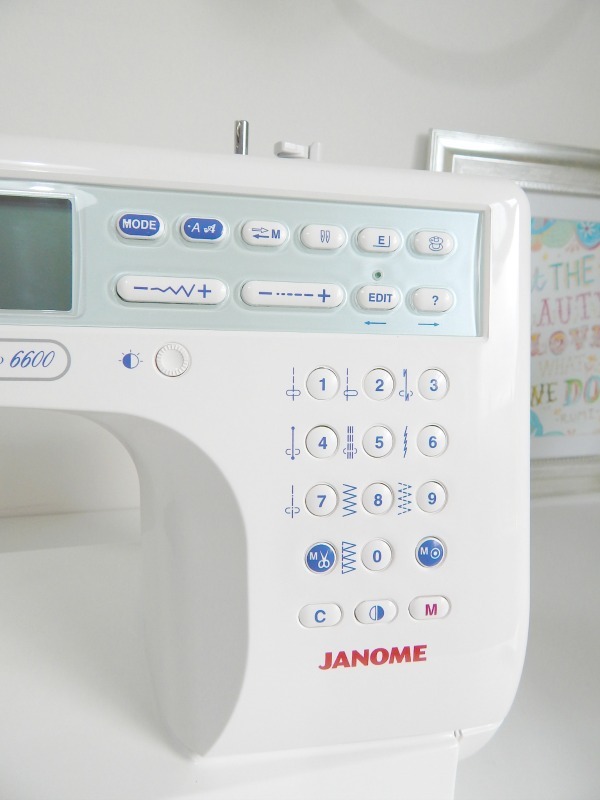 In summary, my first impressions of the Janome 6600p are that it's going to be a real workhorse, but with tons of added useful features....maybe more like a work unicorn? I've used it a bit over the last week and the one and only criticism I can come up with is that the light is not as white as I'd like it to be. We have daylight colour bulbs in the ceiling lights in our studio, so the bulb of the machine not being daylight colour is slightly noticeable. That's not bad if that's the only criticism I can give you so far! 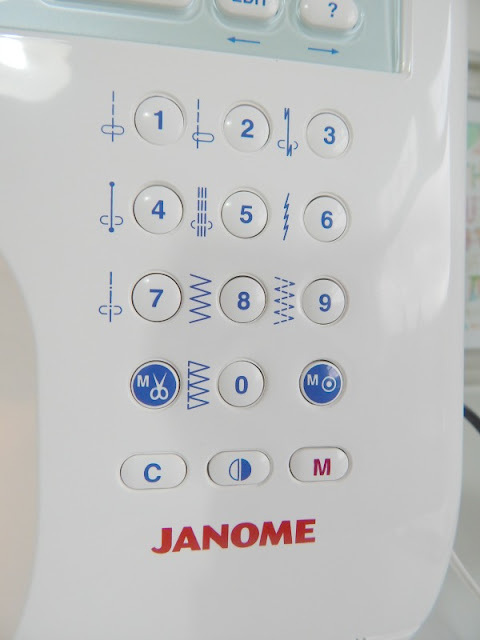 I'll be back with a full review once I've gotten to grips with it, but for now, I can definitely say I love the Janome 6600p!